 Employing diverse, thorough methodologies and research sources, the author of Prehistoric Textiles (not reviewed) traces the roles of women and cloth through 20,000 years of history. Prehistoric women primarily worked with food and clothing, neither likely to survive the elements, and male historians traditionally felt little need or desire to write about cloth and textiles; thus, much of women's work history has been lost, and we are left with few details for reconstruction. However, Barber's innovative research found that ``data for ancient textiles lay everywhere, waiting to be picked up.'' By reproducing remnants of ancient cloth and garments, she also reproduced women's actual labor, which often required hours upon hours of tedious, painstaking work. Her justification for the assumption of female responsibility for cloth rests on their childbearing and -rearing duties. Women needed to stay close to home, and they required work compatible with youngsters running around--labor that could be interrupted when necessary. According to Barber, women held important positions in society as the primary producers of clothing for millennia, even into the age of emerging capitalist economies. She also deduces, from the patterns and designs of ancient material, that clothing for both sexes served as a visual means to communicate such information as fertility and marital status. (For example, many skirt remnants hold designs assumed to follow the shape of and emphasize the pubic bone.) Although this seems a logical conclusion, there's not really any empirical evidence for it. 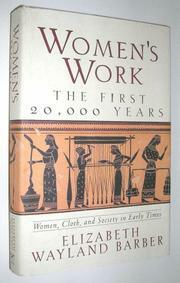 An important contribution, in terms of both historical material and interpretation, to the study of women's work.